What made you interested in knitwear design? I’ve always had a hard time following instructions as I prefer making things up on my own. I think this comes from my background in drawing, I always loved to doodle and just see what would flow from my pencils. Same with designing in the beginning, I would play with simple stitches over simple shapes (like cowls and hats) and see what would happen. It definitely steamrolled after that! Eye-catching, stylish and accessible, incorporated with a spark of culture. Which designers have influenced you? I have two, Melanie Berg and Adrienne Whitewood. I think everyone knows who Melanie Berg is. I absolutely love how she can combine seemingly simple stitches, or design concepts (for example, lace + stripes), and creates something that just blows everyone away. 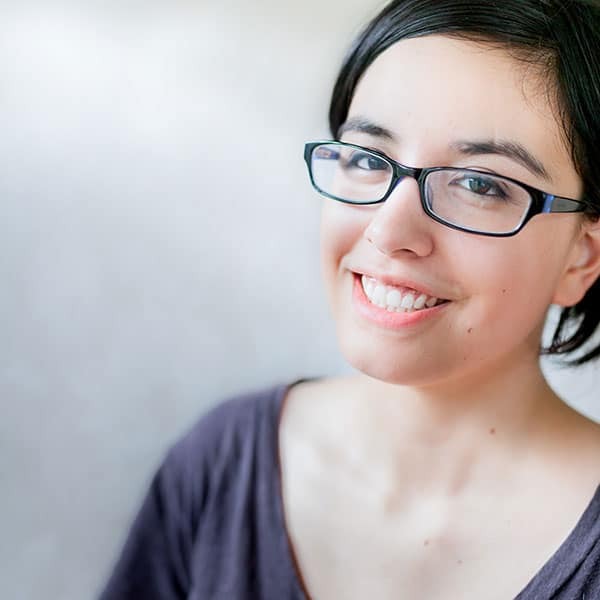 The second one, Adrienne Whitewood, is a Maori fashion designer. As someone who seeks to incorporate the Maori culture into designs, I find myself often studying her work to see how she does it. Most of your designs are accessories but you’ve recently published a few garments. Given you’re still somewhat new to designing, do you have an idea of where you want to focus? Shawls are my favourite go-to for designing but I have found the process of designing a garment to be very enjoyable, even if it can also get really stressful sometimes. What’s your process like? 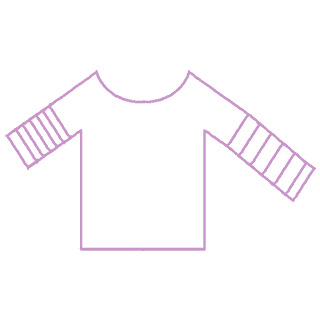 For example, do you sketch, start with a stitch pattern, see something RTW? I start with a sketch, jot down the details such as the placement of stitches, what colors I want to use, detailing, etc. Then I move onto finding a stitch pattern that best represents my idea or theme of the design. This is followed by a first round of swatching to test out the stitch, selecting the yarn, figuring out the math for the pattern draft, swatching again with the yarn (and confirming that the math is correct so far). The process takes about a week or two. The actual knitting of the sample varies between a few days to three weeks, and I take notes of any changes that come up while I’m working it. Then I flesh out the pattern even more and send it off for test knitting. You’ve been working with a lot of yarn companies and stores this year. Tell us about that. I’ve been very fortunate to make good relations with Lucinda of Mont-Tricot – a local yarn store owner in Canada – as she has so many connections with yarn makers and other fiber artists in the industry. My first collaboration that she set me up with was with Everyday Peacocks (Kam makes the most wonderful shawl pins!). For that project I used Julie Asselin‘s gradient yarn to make the Aura Stole. I’ve also had the opportunity to work with Frabjous Fibers (the Simply Familiar shawl) and with Frida Fuchs Yarns for the Mizu Shawlette. Recently I finished a design for Hill Country Weavers, my local yarn store in Austin, Texas where my knitting journey started. It was a great honor to design for them for their first house yarn. Now I’m working on a collaboration with Artyarns (thank you Lucinda) for their new gradient yarn line and I have plenty other projects (some secret) lined up from indie yarn dyers located around the world (Indonesia, Australia, China, the United States). I think I was able to attract people through my social media presence and my commitment to empowering creatives in the industry. When working with the indie dyers, like really small businesses or ones that are JUST getting started, I design something special for their yarn, review the yarn (that’s my Yarn Cakes and Tea segment), release the beta pattern for free and use that opportunity to introduce them to a new yarn maker that they may have not heard of. Then I give the official pattern to the indie dyer to sell as a kit in their shop. knotions note: Check out Francoise’s instagram account – she shares gorgeous pics and inspiring stories. It’s no wonder she has over 7,000 followers. What’s a favorite part of one of your designs and why? Watching your design come to life and seeing that the final results came out so much better than you could have expected. Knitting up a new design, especially one that ventures into new territory for me is always scary and sometimes stressful. Sometimes I have leave my judgement right until the very end, when it is off of the blocking boards and on a mannequin to see how it falls and fits. But I’m always so happy when I kick my doubts aside because they come out so nicely! 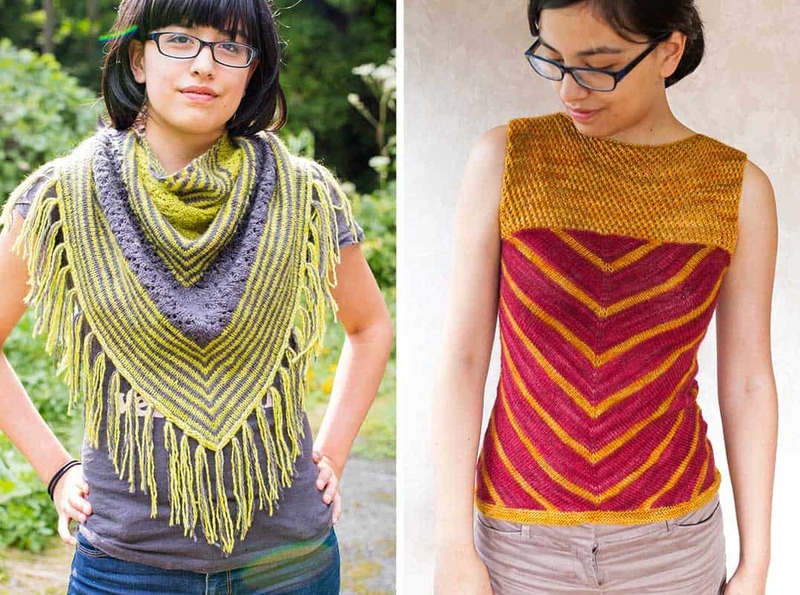 Mizu Shawlette – free beta through Nov 13! What’s the hardest thing about designing? Anything to do with math, since it was never my strongest suit. Thankfully it is pretty simple equations but I always have to be careful. Do you use a tech editor? Sample knitters? 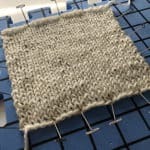 I mainly use test knitters, who do a wonderful job of pointing out the errors in the math and brushing up on any of my instructions that need cleaning. I sometimes work with a tech editor as well as I become more and more busy due to the expansion of my brand. Tell us a bit about your non-knitwear design career. At the moment, designing is my only career. Due to visa restrictions and also the area I live in, I can’t work. My husband and I are moving back to the States next year, which will most likely mean that I will have to re-enter the workforce, so I am putting my all into this year that I have left to make the most out of my designing and mentoring. My goal is to be able to reach financial stability and growth with my work so I don’t have to worry about finding a new job. In addition to designing, you also offer designers advice and support with your Designer E-Courses. 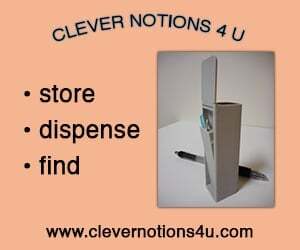 They’re a great resource! Tell us a bit about them. And what inspired you to do them? Over the summer I was thinking about ways I could expand the Aroha Knits brand and bring extra value to my current audience. One day I received an email from an aspiring designer asking me to teach her how to write a pattern. It took me off guard and I wasn’t sure at first how to answer it since I taught myself just by observing how other designers wrote theirs and from feedback from test knits. However I didn’t want to leave her hanging so I wrote up a pattern template, explaining what each section is for and what information was included. When I put it on my blog, it was well received so I decided to focus on writing weekly articles about design or online biz. Over the next few weeks, I really learned how to create content that my audience was really interested in and gauge interest for a “master” design course. What do you like to do when you’re not designing (or supporting your designing)? When I’m not designing, I can be found reading fan fiction, catching up on the latest pop culture or geekdom news, chasing my cat around the house, or going on hour long drives with my husband through the countryside. There isn’t much to do around here, so we have to get really inventive on how to entertain ourselves! Between your design inspiration, your master courses and the fun bits and challenging parts of designing we’ve learned so much! Thanks for sharing and visiting with us today! Enter to win an Aroha Knits pattern of your choice*! It’s simple – leave a comment with your favorite pattern. 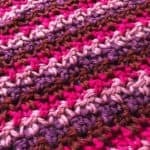 We’ll give away one free pattern for every 50 comments. * value up to 10 USD and downloadable from Ravelry. Entries due by end of day Saturday November 14th EST and will be picked on Sunday the 15th. We picked a winner! Congrats Jules O! We have several more lined up but if there’s anyone in particular you’d like to hear from, leave a comment or drop us a line. And if you’re a designer or yarnie and you’d like to be considered for the Focus series – let us know! 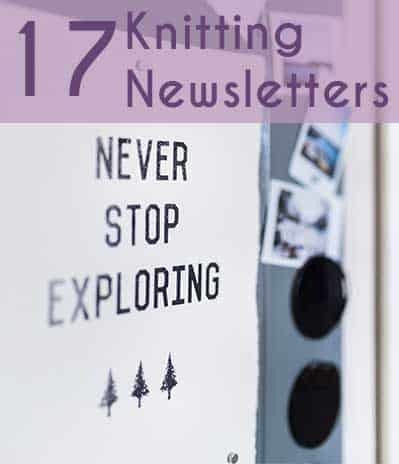 Want to stay in the loop with what we publish? Subscribe to our blog emails (up there on the right) or add us to your favorite RSS reader (RSS link up at the top). Upcoming posts include a review of Laura Nelkin’s Adornaments and a calculator for mods like waist shaping and sleeve length. Plus be among the first to know when a new issue is out and see a sneak peak of the preview. And as always, we promise never to rent or sell your email address. Thank you for trusting us – and you can unsubscribe at any time (but we hope you don’t!). Until next time – knit smarter! All her patterns are gorgeous but I love the Iraira Shawl. She is such an inspiration with her blog and gracious sharing of her knowledge. My favourite pattern is the Puaka shawlette. I’d really like to knit this someday, maybe in a lovely Frida Fuchs yarn. De très belles pièces! J’ai déjà acheté deux patrons, à faire éventuellement. J’aime beaucoup Aura ! Merci MMe Danoy ! I love the look of her patterns that you show here. I think they would be fun to knit. The patterns are beautiful! I love the Huatau cardigan! I’m knitting the Enchanting Vine Slouchie Beanie and is such a pleasure to knit! I love the Huatau hat and the Puaka shawl, really neat! Tiu Top would be my pick. The Whakamarie top is my favorite. But lots of pretty patterns! The interview was very well done. Would enjoy more. She has absolutely beautiful designs, & I really like the Aura pattern!! So many great patterns! I’ve had the pleasure to test a few for her! 🙂 I’m currently loving the Simply Familiar shawl. Once I’m finished with the Caprius shawl, that will be next up! I’m not a big fan of multicolored knits so I like the Mizu Shawlette. Very clean looking. I’m loving the Puaka shawl! Great interview! Wow my eye caught the Maia Tee, and I just keep coming back to it. I just think it looks so good. Always lovely getting to know the talent behind great patterns. The Tiu Top is wonderful. The Caprius Shawl is my favorite- she does beautiful work! I’ll be sure to check out the e-courses, too! Pukka is my favorite… at the moment. They’re all quite lovely! Such talent and such gorgeous designs! Thanks for sharing Jody. 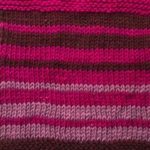 I first saw your beautiful work in Holla Knits – thanks for sharing your processes.